Kun Huang, PhD, an internationally recognized scientific and academic leader in bioinformatics and computing, has been named the director of data sciences and informatics for Indiana University’s first Grand Challenge initiative, Precision Health. Dr. Huang, whose research focuses on translational bioinformatics, is currently a professor of biomedical informatics at the Ohio State University, where he also serves as associate dean for genome informatics in the College of Medicine and director of the Division of Computational Biology and Bioinformatics. Dr. Huang received bachelor's degrees in biology and computer science in 1996 from Tsinghua University in Beijing, China. From 1996 to 2004, he studied at the University of Illinois at Urbana-Champaign, where he obtained Master of Science degrees in molecular and systems physiology, electrical engineering and mathematics, as well as a PhD in electrical and computer engineering. His research interests include translational bioinformatics and integrative genomics tools for precision health, algorithms and software for mining and visualizing large and complex biomedical data, computer vision, machine learning, medical imaging and computational biology. Dr. Huang will join IU on July 17, 2017. 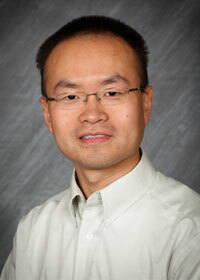 In addition to his role as director of data sciences and informatics for the Precision Health Initiative, Dr. Huang will serve as chair in genomic data sciences for the Precision Health Initiative; assistant dean for data sciences, professor of medicine, and Center for Computational Biology and Bioinformatics senior investigator at IU School of Medicine; and senior investigator at Regenstrief Institute.